Cruising Mates Forum: Cruise reviews, chat, answers and information. cruisingmates.co.uk • View topic - Marco Polo? Sorry Mungo - I must have missed those photos. There was a Portuscale ship ip on the pages too. Saga Ruby was sold to be a floating hotel in Myanmar but following various posts on a different forum, it became apparent that the company that were going to use her had gone into administration. She has ben sitting in a shipyard in Thailand that is not equipped to carry out the conversion and there were hints that she was transferring to a shipyard in Rotterdam to be worked on. So, it is highly likely that she is up for sale again - wouldn't it be great if she could be brought back into service either as a cruise ship or a floating hotel somewhere inEurope where all the Saga Ruby fans could stay on her again (and others too of course). 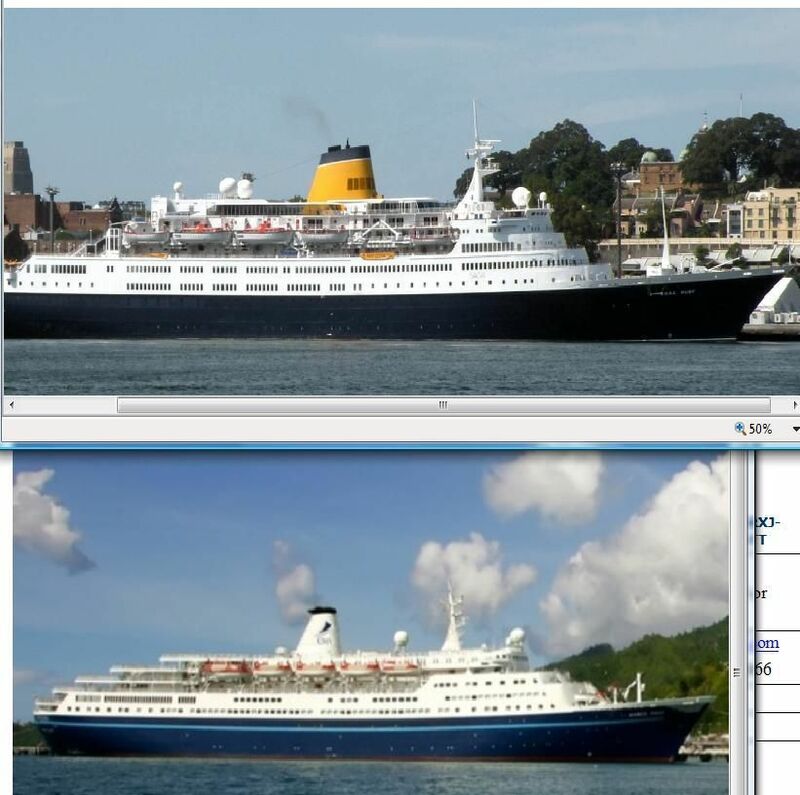 Trace wrote: I'm just watching Mighy Cruise Ships on Quest at the mo, it's a Marco Polo cruise that it is featuring, on a Baltic cruise. I saw the programme a few months ago...... Really enjoyed it. khkate wrote: Sorry Mungo - I must have missed those photos. There was a Portuscale ship ip on the pages too. Would be nice to her back in the UK. khkate wrote: ..... would be a suitable addition to the Saga fleet. Certainly her ice-strengthened hull would make her ideal for the Arctic cruises. Vintage ships like vintage cars are expensive to maintain and although are great sentimental value seldom perform as good a newer models. Mungo wrote: Ship for sale and Saga Ruby....... They sadly look the same. Pete, both Marco Polo and Saga Ruby are up for sale. Total facepalm moment there Pete reason read the whole thing before replying! We were in no doubt about different ships! Mungo wrote: Pete, both Marco Polo and Saga Ruby are up for sale.
" Ship for sale and Saga Ruby"
which to my understanding of the English languauge means two seperate identities i.e. the ship for sale being the subject of the thread Marco Polo and the Saga Ruby. However an alternative way of reading that statement is as a comparison of the ship for sale with the Saga Ruby to confirm identity. Peka wrote: Total facepalm moment there Pete reason read the whole thing before replying! We were in no doubt about different ships! Read my explanation of English lanuage quirks in sentence constuction in my earlier reply.